"Back in the 1960s, I managed a merchant seamans' bar in Corpus Christi, Texas. I had the privilege, for a few years, of serving "booze" to men (and a few women) from all over the world who came in on merchant ships. This was one of the best times of my life. Fast forward a few years to a time when I had a chance to see The Irish Rovers live in concert - a quartet I had long liked because of their song "The Unicorn", and which took me to buying two of their cassettes. They did a good show, and somehow, I got a tin whistle from one of them, which I have to this day. Unfortunately, as music came in on better sources (like CDs), my tapes got relegated to a box and I forgot about the Rovers for a time...."
Comments: Love this album. The Irish Rovers just make me feel good and they're getting better with age! Two favorites are Titanic and Whores and Hounds. Embarrassed to say I didn't actually know Titanic was built in Belfast until I heard the song - really beautiful. 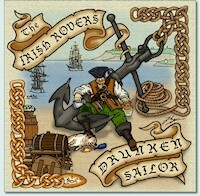 Want to write a review about Irish Rovers's Drunken Sailor album? Post your comments in this box to be displayed in our community forums and in our album database! Please make sure you are logged in before proceeding. Please login to write your comments about Drunken Sailor.